This beautiful flame point Siamese was born late in 2017. Niko is shy with strangers at first but likes to be petted. He really enjoys playing with his toys, and is great at entertaining himself. He is friendly with cats and loves to play with the other cats and kittens in his foster home. Niko is currently in foster care. 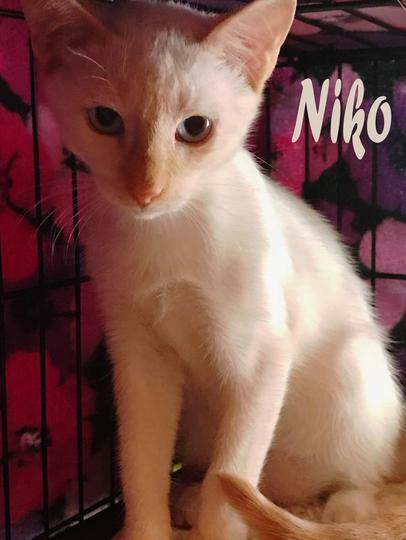 His foster mom reports that he has become quite loving with her, but still lacks confidence, and needs a permanent home with someone who can devote lots of time and attention to Niko to help him become more secure. ​If you're looking for a beautiful, loving cat, who will reward you richly for your kindness, call Suzanne about Niko.